Have you trusted God for something and it happens? Jesus said in Matthew 17:20 " If ye have faith as a grain of mustard seed, ye shall say unto this mountain, Remove hence to yonder place; and it shall remove; and nothing shall be impossible to you." Did you catch that? NOTHING SHALL BE IMPOSSIBLE TO YOU! Do we trust his word? An appeal to Congress urged our nation to include recognition of God on American currency during the Civil War. A response was written from the Secretary of the Treasury, Salmon P. Chase, "No nation can be strong except in the strength of God, or safe except in His defense. The trust of our people in God should be declared on our national coins." 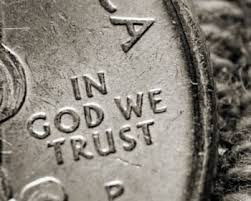 The Mint began with a few coins and since 1938 all U.S. coins have carried the inscription "In God We Trust". We say it but do we really believe it? Think about this - It is easier to accept the impossible than to expect the possible. Do you find yourself wanting to throw your hands up in the air and walk away with a pitiful sigh? "I tried" takes a small amount of energy. The minute exertion of a "try" cannot be compared to the "stick-um" you've got to muster to wait on the possible. Possibility takes belief, faith, strength, courage, patience, humility, sweat, and many tears. Possibility is not for the weak and fainthearted. Praise the Lord, unlike men, impossible is not God's standard operating procedure (Matthew 19:26)! I have trusted God's power to remove mountains. Have you? Are you dealing with a mountain right now? Have you looked at it, decided there's just no use. It appears impossible to climb, move or scale? Have you pulled up a chair to sit down in it's shadow with your head in your hands and a frown on your face? You're in a good position. Bow your head a bit more, drop to your knees and ask God to show you his possibilities, your possibilities. Believe him, stick with him until it happens. Never give up on God because he never gives up on you! Try this...Set aside one coin you can keep with you all the time. Seeing is believing. If you are about to throw your hands up, reach into your pocket instead. Take out your coin and read it. Visibly remind yourself "In God We Trust, because with Him, All Things are Possible!" I love your post. You are right it takes a lot to fight, but the victory is much sweeter in the end than anger and being mad at yourself for not trying. to do the impossible to us but, all things are possible with my God. Yes I am dealing with a mountain right now and yes I have thought about not trying anymore. I am begining to see the light once more till the Devil comes sticking his head out again, which I know he will but, I pray God gives me the words and confort I need at the time to chop it off when he does. I will never forget the "stick-um" message from Randy! I can hear him saying it now. I pray you'll have that "stick-um" and the words you need for your mountain. Just keep fighting! Thanks for the comment!